I really don't know how to title this better. 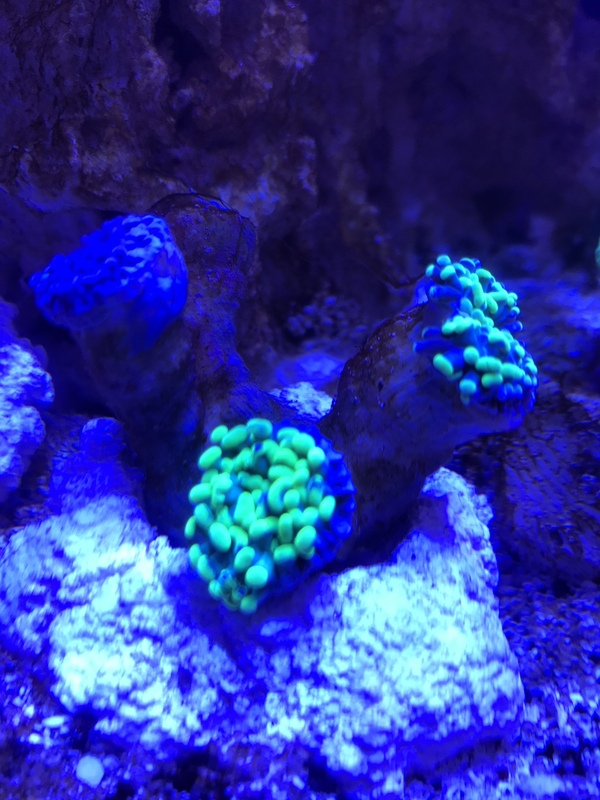 My hammer frags have been... rather unhappy for about a week. Everything seems to be pretty stable, I've been doing all the tests constantly, but I'm getting absolutely no extension from them and there's always some... weird long strings of black looking stuff coming off of them. Temp is super stable at 78. There haven't been any real.. anything. I thought maybe there was too much flow or too much light and moved them all the way opposite the MP10 and turned the flow way down. Still no change. Lights are about 18 inches 13 inches after measuring off the water and the frags are about 10 9 inches under water, kessil A360we running at 60% max. Edit: here are some terrible pictures to show what I mean. Interests:Family, engineering, coral rehab, winemaking, gardening, and bead weaving. How old is the tank? Anything hosting in it or picking at it? Can you take a fts? About 5 weeks. The rock was cycled for much longer than that. But since it was completely setup and fish added, 5 weeks. I hate to be the bearer of bad news, but that's probably the problem. You may want to have someone hold the coral until your tank is a little more mature. You've got some cyano, which indicates there's more going on than what your parameters show. You may have excess nutrients that the cyano is utilizing (and then making your test artificially low). You most likely don't have a stable bacterial load, which might be mini-cycling the tank that you also aren't picking up in test kits. There may be some other root causes, but a 5 week old tank is where I'd start. Heh. You’re most likely right. I don’t think there’s going to be anyone holding it, not anywhere close to where I live anyway. I suppose I’ll just keep up with the maintenance and hope they make it. You can also try dipping it in iodine ( Lugol's iodine is good) and see if it helps. Whats the calcium and magnesium levels? You have two classic symptoms of too much light. Your corals aren't expanding, and they're expelling their zooxanthellae. Move the corals to a shady spot. It may take them a few days to act normally, but don't worry. Corals can last a long, long time with too little light. But too much light can kill them quick. I don’t have iodine. Actually I don’t really have any medications. That might need to get fixed. What would iodine do though? I haven’t tested calc and mag. However, there have been frequent enough water changes that I highly doubt either of those is extremely out of whack. Too much light is what I thought too. I did move them already, the tank is pretty small, hard to find a shady spot. I’ll turn all the light down 50% for a few days and see if that helps. When I say 50% I mean turning them down from 60% max to 30% max. Thing is, it already only had a photoperiod of about 4 hours at 60%. The rest of the day it was at much lower. It doesn't look like they care at all. If you aren't using any medications, now is a good time to start, as mentioned. There are lots of good dips, and you really should dip all of your coral before they go in your tank. This will help prevent a ton of headaches later. I personally like hydrogen peroxide dips, Bayer dips, and CoralRx. Recommend starting with a commercially prepared solution (e.g., CoralRx, Lugols, Revive, etc.) until you're comfortable with it. 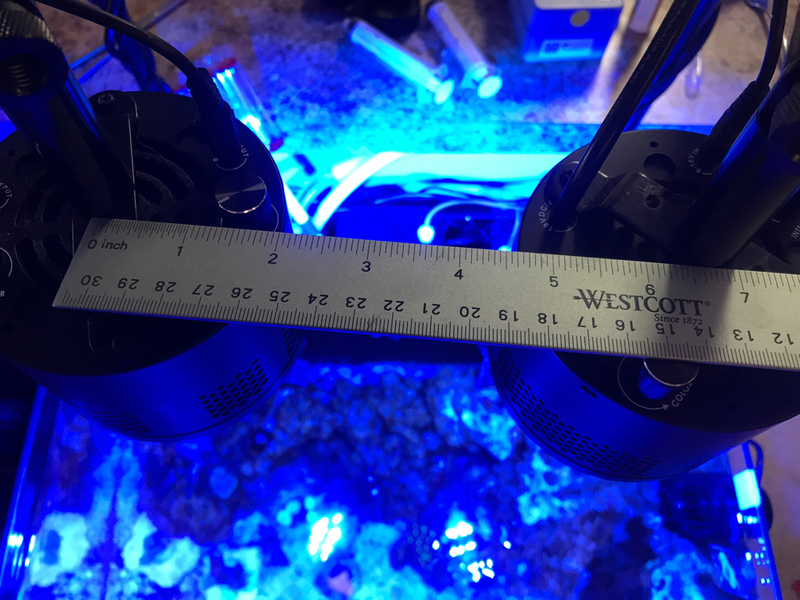 With a Kessil A360WE 18" off the water, you'll be lucky to see 50 PAR anywhere in the tank with the light at 100% intensity so it's extremely unlikely that it's receiving too much light; to get respectable PAR levels, they have to be mounted 6-8" off the water unless you're running multiple arrays, closer together. In your setup, that probably leaves the edges of the tank, dimly lit (meaning you'll need another). What setting (mode and %) are you running on the MP10? Few corals do well in a constant flow situation that is hitting them directly. Ultimately, I believe you have a tank that is relatively sterile due to its age. I would suggest double checking salinity with a properly calibrated refractometer (i.e. 35ppt solution), conductivity probes are all but useless most of the time. So I just went and did some actual measuring instead of eyeballing it. The lights are almost exactly 12” from the top rim of the tank. 13.25” from water level. The hammers are all about 8-9” below the water surface. This is my light setup. All the hammer frags are in the front left corner of that pic. They are 6” away from the center of the left light and 12” away from the center of the right light. The MP10 is running in lagoon mode for most of the day at 30%. At night it goes into constant at 15%. And the salinity is checked both with conductivity probe and refractometer. I also use 35 ppt calibration fluid pretty religiously and they are always measuring exactly the same. That is still quite high but with two, should be fine for LPS. Have you checked the PAR yet? If not, I can set up a couple Kessils to match your configuration and get you some numbers for a ballpark. OK, are they about 3" apart? What color setting are you using? They produce the most PAR between 50-60% color and fall off quite a bit on either side of that range. OK, I could only go down to a depth of 7" because a coral is in the way but PAR was about 95 (the lights are also 7.5" apart on center because my mounting bracket gets in the way). This was at the 60% peak. At 30%, PAR is 55. PUR was 69%. OK, I could only go down to a depth of 7" because a coral is in the way but PAR was about 95 (the lights are also 7.5" apart on center because my mounting bracket gets in the way). This was at the 60% peak. At 30%, PAR is 55. That's extremely helpful. Thank you! That said, with this info, I'm definitely ruling out too much light as the problem. There is no reason a hammer coral should be unhappy with too much light at 50-100 par. Sigh. I moved the MP10 so it's flow gets broken up a bit by the rock, it was fairly direct. I'm really not sure what to do now. The coral may have come out of a tank that had very little PAR (most LFS are super low). It will survive at 50 PAR so you may want to cap the light at the 30% peak to see how it responds. I generally try to bank direct flow off the glass to diffuse it but I think you're OK on those settings because the pump looks to be more than half way up the side and the euphyllia looks to be on the bottom of the tank. That’s definitely possible. I’ll do that for a while and see how it goes. And yea, the pump is in the top 3rd of the wall. The coral is on the bottom on the opposite side. Well, after a week of turning down the lights to 30%, flow down 10-15% and moving them down to the bottom, opposite and behind a rock...ish from the MP10, they are all looking much better.